Apply the law for the benefit of our clients to provide peace-of-mind solutions to protect their assets — everything they own and everyone they love — to the greatest extent legally possible with the highest possible moral and ethical standards. Due in large part to healthier lifestyles and advances in modern medicine, Americans are living longer. For the first time in the history of mankind, many millions of individuals have the expectation of reaching age 80 and beyond. With Americans living longer comes an increase in the likelihood that they will outlive their ability to care for themselves and end up in a nursing home or some other form of long-term health care. When you add to that the staggering costs of long-term health care, you get the real likelihood of financial ruin for many families as they face the prospect of outliving their money and assets. Retirees who have played by the rules their entire lives, worked hard, lived frugally and saved as much as they could in the hopes of having a nest egg for themselves — and leaving some measure of financial security for their children and grandchildren — are seeing their legacies evaporate as the need for long-term care arises. A recent survey revealed that 50 percent of the baby boomers falsely believe that Medicare will provide chronic or custodial care for themselves and their parents. They are often shocked to learn that Medicare does NOT cover the chronic problems that cause an individual to need a nursing home or assisted living facility. The only governmental program that provides benefits for people with chronic problems who require custodial care is Medicaid, with its impoverishment limitations, which came into being at a time when life expectancies were shorter and few people required long-term custodial care. Contrary to popular belief, you do NOT have to spend down all or most of your assets in order to qualify for Medicaid? In fact, in 2006, Congress made sweeping changes to the Medicaid laws that often allow the spouse to retain, in one form or another, virtually 100% of the couple’s combined resources. The laws for unmarried individuals differ. But, with Medicaid, due to the large quantity of misinformation, there is one law for the informed and one law for the uninformed. The elder law attorneys at The Elder Law Firm PC want you to be informed. 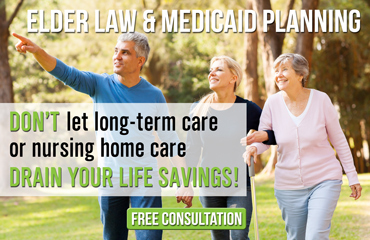 Our experienced attorneys specialize in the law relating to Medicaid and long-term health care issues and practice in the areas of estate planning, Medicaid assistance, and veterans benefits planning. We find honest ways to protect our clients’ homes, loved ones, values and independence — to ensure that our clients never run out of money and never run out of options.